Of all the messages I received on my last day of pastoral ministry, this may be my favorite. I’ve been a pastor for the better part of twelve years, and worked in parish ministry for a good six years before that. The only thing that’s lasted longer in my adult life is my marriage. Until Adam asked me to write for this series, I hadn’t thought much about pastoral identity because for a long time now, pastor=me and me=pastor. That doesn’t mean I had no life outside of pastoral ministry. Nor does it suggest that I approach my everyday life all “ministered up.” I mean it more in the sense of seeking congruence in my professional and personal identity. I want to be the same person in the pulpit as I am with the swim team carpool—though there are obviously different expectations and norms in each place. Now I’m a pastor without a congregation. For a long time I’ve been “bi-vocational,” serving as a solo pastor part-time while pursuing various writing projects, including a book published in 2012. The writing lent itself to speaking engagements and retreats, and things went along until I began to feel the call to focus exclusively on writing and speaking. Thank you for the privilege of praying with you; visiting you in the hospital; baptizing your babies; cradling the dying, literally and figuratively; dreaming with you about how a small yet mighty church can serve its neighbors; sharing the bread of life and cup of salvation; singing songs of praise and lament; and sharing many, many many cups and coffee and cheese balls after church with you. No, my ordination won’t expire once I’m no longer drawing a paycheck from a church. But also yes—what exactly is a pastor without a congregation to serve? I know many former pastors who go on to do other things. It happens, and it’s often wonderful and exactly what the Spirit needs. I just don’t quite know what it will look like for me yet. There’s another reason I resisted the call to stop pastoring in order to focus on a writing and speaking ministry. There are lots of pastors who do those things while serving churches. Being connected to a congregation provides credibility and a depth of experience to write about and from. What will this new chapter look like for me? How will my writing and vocation shift without this grounding in leadership in a congregation? Am I ready for that change? Which is why I appreciated the “welcome, traveler” message. It came from a writer friend and a decidedly non-churchy person—a self-described “antagonostic,” in fact. K’s message made me laugh and also reminded me that though this new vocation feels like a loss—and it is—the church often looks like an insular club to people outside of it. As much as we seek to be outwardly focused, we have our own language, inside jokes and provincial concerns. Meanwhile it’s a big world out there. As I write this, I’ve been a pastor-without-a-congregation for less than a day. So we’ll see how issues of identity get shifted and questioned and folded and spindled. I’m eager to see how it all turns out. MaryAnn McKibben Dana is a writer, pastor and speaker living in Virginia. She is author of Sabbath in the Suburbs, a Chalice Press bestseller for two years running and a “must read” by Ministry Matters. Her forthcoming book is Spirituality for the Smartphone Age. 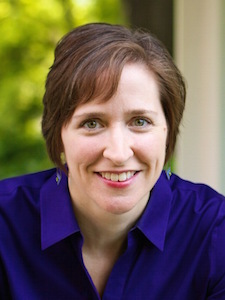 She is co-chair of NEXT Church, a movement within the Presbyterian Church (USA) that seeks to call forth vital ministry for our changing cultural context. MaryAnn is a graduate of Rice University in Houston, Texas and received her M.Div. in 2003 from Columbia Theological Seminary in Decatur, Georgia. She is a mother of three, a haphazard knitter, and a slow marathoner. Connect with her at her website, The Blue Room (theblueroomblog.org).